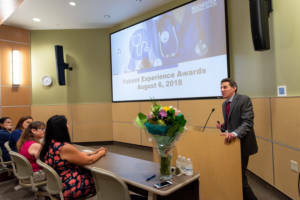 Unity Hospital kicked off their very first Recognizing Excellence Patient Experience Awards at the Unity leadership meeting on August 6. Two employees were honored with this award. Erika received the most Recognizing Excellence cards from patients and families, and is known by her leaders as “extremely hardworking with the biggest heart.” It is clear that her patients and their partners in care appreciate that she puts her whole heart into her work. 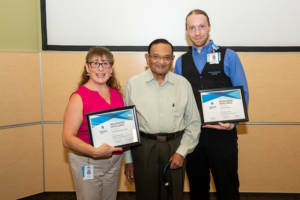 The Unity Recognizing Excellence Patient Experience Awards are awarded twice per year to staff members who demonstrate extraordinary compassion and aptitude for creating a consistent and superior patient experience. Winners are selected from Recognizing Excellence cards, patient feedback surveys, and compliment letters. Eligible staff members include those who interface directly with patients and are identified by name in one of the above mentioned forms of positive feedback. Leaders and providers are not eligible. Winners will be featured in a display in the hospital lobby. Posted August 15, 2018 under _Featured Stories List, Locations, Recent News, Unity Hospital.